There is no VAT paid on Jaffa Cakes, razors, and pitta bread, unlike tampons. 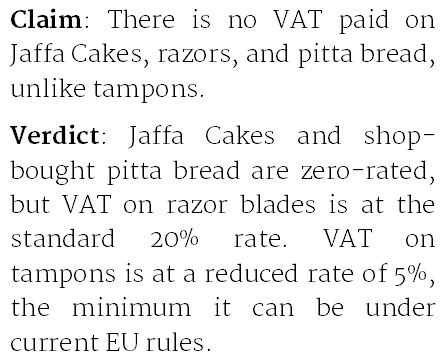 Jaffa Cakes and shop-bought pitta bread are zero-rated, but VAT on razor blades is at the standard 20% rate. VAT on tampons is at a reduced rate of 5%, the minimum it can be under current EU rules. "Jaffa Cakes are zero-rated. I am not a fan of Jaffa Cakes—let it be known that if I am offered a Jaffa Cake, I will refuse. I do not consider them to be essential to my life; I can give or take them. I recognise that razors are zero-rated, and judging by many Conservative Members the opportunity to shave every day is a human right. They are cleanly shaven, and I am sure they would be concerned to be charged a higher rate of VAT. Pitta bread is zero-rated—we can probably all agree that that is a necessity. What is the kebab without a good pitta bread around it? It is a necessity." A number of MPs have called for an end to the "tampon tax", arguing that tampons and other sanitary products are essential items and so VAT shouldn't have to be paid on them. Currently they're subject to a VAT rate of 5%, reduced from the standard rate of 20%. No VAT is paid on cakes, on the other hand. After no small amount of controversy it's been determined that Jaffa Cakes count as cakes, despite having "characteristics of both cakes and biscuits", and so we don't need to pay VAT on them. Razor blades, on the other hand, are taxed at the standard 20% rate. We've also asked HM Revenue & Customs, who confirmed that. We've asked Ms Creasy's office to comment. And in the case of pitta bread, it's complicated. If you buy it at the supermarket you pay no VAT, as with other bread. But if it's part of a hot take-away meal (wrapped around a kebab for instance) it'll be taxed at 20%. EU rules mean that VAT rates can't be lowered below 5%. Categories of products that were already taxed below this rate prior to 1991—like cakes and bread—can continue to be taxed at that lower rate (0%, in practice). The government says that all 28 EU countries would have to agree to any changes to the rules. The authorisation for the EU to make rules on this at all comes from an article of the EU treaties that requires them to be passed "unanimously".